Technoresin offers a wide range of products for the electrical industry. Epoxy, Polyurethane, Polyester and Silicone Potting resins, Room Temperature Curing (RT) and Heat Curing Systems, Casting Resins for heavy electrical switchgear applications (heat curing), Casting resins for electromagnets, Silicone casting resins for potting vibration products, Polyester casting resins (both flexible and rigid), Re-Entrable PU resins to enable components to be repaired, DMC compression mouding products, are some of the products available. High Elongation at break; available in soft to hard; Low heat development (large volume castings); easy to accelerate; Excellent impact strength; Excellent thermal shock resistance (hot & cold cycling); Good mechanical properties. Re-entrable systems easy to process. Sensitive to humidity when liquid; Soft and very elastic systems have a dielectic constant which is not stable above 50 C; Exact mixing ratio required. Recommended Applications: Equipment sensitive to vibration and where low shrinkage around the components is required. Supplied in twin-packs. Not sensitive to humidity in liquid form (long shelf life packed in ordinary buckets). Clear systems easy to process. High heat development (exotherm). Amines are more of an health risk; Exact mixing ratios required. Medium adhesive and mechanical strength; Not sensitive to humidity in liquid form. Very clear castings possible (rigid); Soft and flexible systems available; Low cost; can be filled with fillers quite easily. Catalyst required 1 to 2%. Rigid systems are brittle; Low impact resistance; High heat development (exotherm) Small volume casting; Poor Thermal shock; Waxy surface; High shrinkage; Six month shelf life. Electronic equipment may be sensitive to shrinkage or vibration, therefore we recommend the use of polyurethane or epoxy potting system when ever possible. However PU systems are sensitive to humidity and have to be packed in foil twin packs. Semi-flexible foam used to fill boxes. Good water absorption (1,5 g / L) and low water vapour permeability. Twin – packs or containers. Easy to break off and open the unit for repair. Used for sensitive electronic equipment. The dielectric constant changes markedly at temperatures above 90 C. Flame-retardant. Twin-packs. Re-entrable, slightly harder than RPU313Twin-packs. Filled. 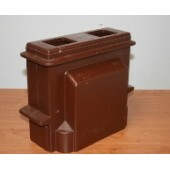 Available in Twin-packs and 5 & 10 kg containers. Good mechanical properties, not as sensitive to humidity as other PU systems. Filled with non-abrasive fillers; black; medium to low viscosity. Elastic. Supplied in twin- packs. Filled with non-abrasive fillers; Black; Slightly higher viscosity than X142 and elastic. Supplied in twin – packs. High quality elastomer; resin - hardener mix ratio can be varied giving a Shore Dardness D from 20 to 60 D. Can be operated up to 120 C. Low shrinkage around components. Supplied in twin – packs. Tough and very elastic PU. Elongation 550%, Shore Hardness A 6; long pot life (20 minutes) - easy to cast. Available in twin-packs. Widely used to encapsulate small power transformers, including 3000V transformers for security fencing. This system has a convenient 2:1 mix ratio, low viscosity and is slightly flexibilized. General purpose potting resin, most often used with EH16 for glossy surfaces. General purpose, slightly amber in colour, low viscosity resin used for casting / impregnating applications. Rigid and high exotherm. Hardeners recommended – EH16 (very good gloss and clear); Tek113B (amber); EH96 (good colour – hard, HDT 100C, high exotherm). For better clarity use EH230 (water clear hardener) with long pot life, low exotherm and shrinkage - ideal for potting LED Lighting systems. Laminating and casting resin with a 150 C HDT. Semi-flexibilized and tough epoxy system used as an adhesive / impregnating system for steel laminations. May be use for potting where toughness and flexibility is required. Telkom approved blocking resin, slow curing and low heat development. Available in twin-packs or 5 to 10 L containers. Amber in colour. 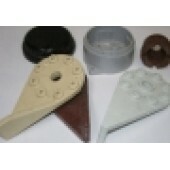 Machinable casting and extrudable resins for the production of CNC machined blocks, moulds and master patterns. Brown and Grey epoxy filled resin, non – flexibilized. 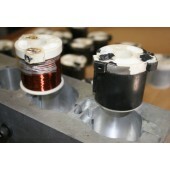 Great for potting electrical components, coils, welding transformers, etc. Excellent mechanical properties. Generally used with Tek113B for good gloss; or CH350 for 100 C HDT. ER105 with EH396 is very flexbile. ER131 (Black) or ER130 Blue are general purpose potting resins, slightly flexililized. Generally used hardeners EH131 and EH132 (slightly faster) , EH396 is very flexible. Natural colour (beige) similar to ER105. Rigid. General potting of small transformers. Normally used with H1 or Tek113B hardener. ER375 - EH375 is a highly flexible casting epoxy for potting and sealing sensitive electronic components or where there is vibration. ER375 with EH396 is more flexible. Epoxy resin, with high filler content, used with anhydride hardener EH275. The resin must be warmed to about 80 C before mixing with the hardener. It is processed at 90 C when gravity cast under vacuum or at 160 C when injected under air-pressure by the Pressure Gelation process (see heat curing systems). Heat Curing Potting system. 48 hours Working Time (Pot Life) at 25 C. Cures in 2 hours at 80 C.
Water clear resin, used with 1 % MEKP for potting. High heat development for a volume over 200 g.
Rigid and clear potting resin. Two component high quality, condensation – type silicone system, used for general potting and mould making . Mix ratio 100 : 4, Hardness Shore A 25, 600% elongation.